One last post before I head into book-writing mode for the rest of the summer... yes, a new title is underway that focuses on a specific quilling topic. I apologize for scanty details, but considering the way time flies, it won't be long at all until I can share more about this project. I guarantee I'll miss blogging... writing posts is one of my favorite things to do. 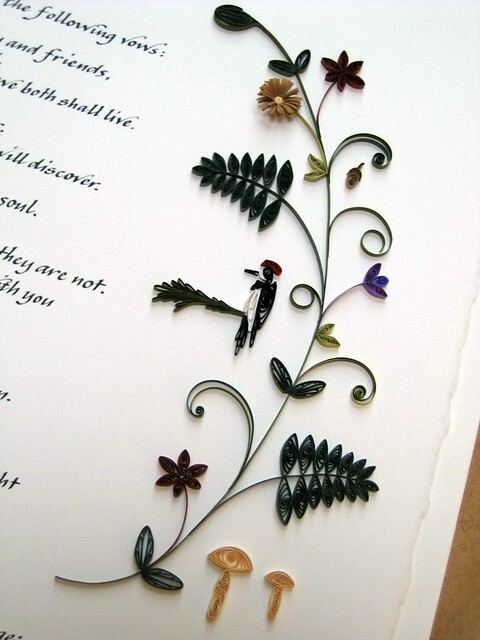 I'm also on hiatus from quilled wedding commissions, but I look forward to returning to them as soon as the manuscript is completed. Here's a Quaker marriage certificate I had the recent pleasure of quilling for a couple who wrote to say they had come across images of my wedding designs. They especially liked the personal touches that related to each couple. As they enjoy identifying and watching native birds from their home in a California redwood canyon, they asked me to create two favorite species, a Steller's jay and acorn woodpecker. They also told me they have three dogs who are considered members of the family and would be part of the ceremony. Could they possibly be included without making the certificate look hokey? I promised to try my best to quill the birds and dogs along with requested sunshine and forest foliage. The piece is a reworking of my woodland design, one that I always enjoy doing. The dogs took center stage at the top of the certificate. The couple told me their yellow lab is a real sweetheart and I hope the paper coils convey her lovable personality. 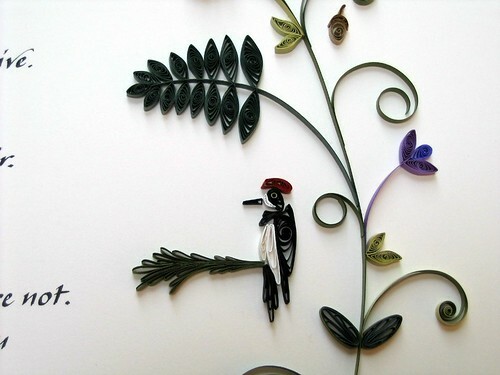 The birds were placed on redwood branches alongside fern fronds, acorns, mushrooms and wildflowers. 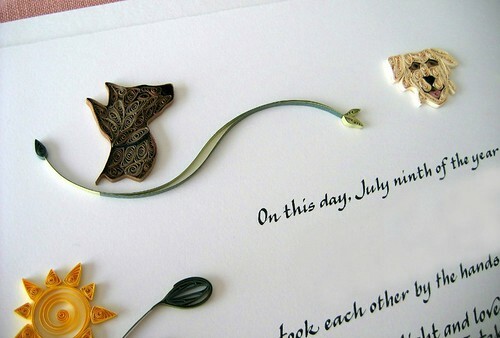 As guests and dogs looked on, the couple signed the hand lettered certificate (by Riva Brown of Living Letters Studio) during the ceremony as a commitment to one another. And as the song goes, See You in September! Meanwhile, I'll send out an occasional, free newsletter that features links to worldwide paper-y goodness (you can sign up here) and will continue to be active on Instagram (@allthingspaper) and Pinterest (@allthingspaper). Absolutely wonderful! The details are exquisite and I am sure much appreciated. I love how you did that and you did a great job of incorporating the dogs into the design. Exciting times Ann! Look forward to hearing more delicious details. Congrats on another certificate that is beautifully tailored to a loving couple. Love the woodland look! This is so perfect, I don't think anything you do would be "hokey"! Aw thanks so much, Cecelia and Lenoria! The dogs & birds look wonderful, Ann! Did you work from photographs? I love how you combined the woodland bits w/ the animals. Wonderful! Aw thanks Tracy. Yes, Google images to the rescue! 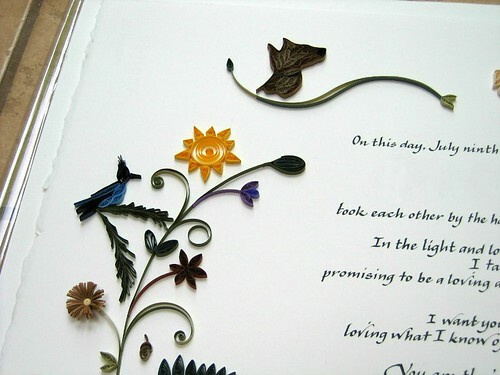 Congrats Ann for your beautiful quilled certificate for the loving couple. Ann, I am VERY slow seeing your post but so excited now to learn you are writing another book! Mom is 100 years old now with advanced Alzheimer's Disease, even though she can still walk without a cane which makes it more difficult to keep track of her. We have just moved to a lovely home in the mountains of the Los Podres National Forest which Chuck and I just love, so not a lot of crafting time for me either. I will definitely look for the new book! Can't wait! Blessings and love. Louise, it's so nice to hear from you. Goodness, you have your hands full. Your home and location sound wonderful. Thanks very much about the book... am approaching the finish line, yahoo! So beautiful!! I am amazed at how beautifully you have done the dog face with basic elements. I always tell my son to read your posts for you write so well. I look forward to own your book . Congratulations on yet another fabulous book Ann.